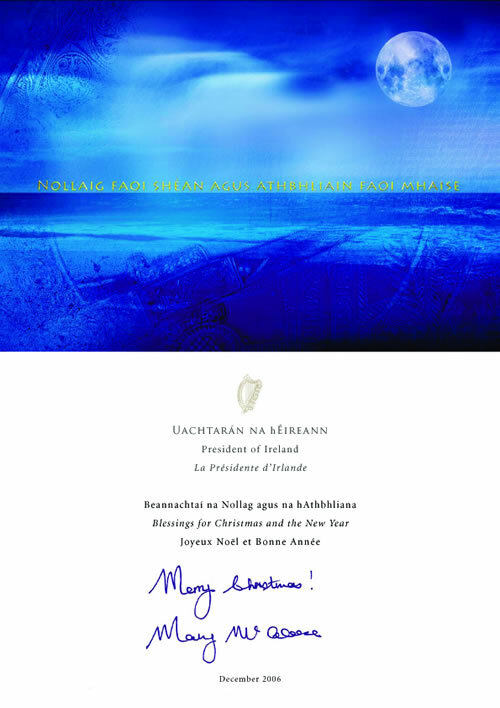 This is the Christmas and new years message from President Mary McAleese first in Irish (as Gaeilge) and then in Englirish. F�ilte go su�omh gr�as�in oifigi�il Uachtar�n na h�ireann. Beidh an su�omh seo ina nasc t�bhachtach le linn m'uachtar�nachtsa, nasc a sh�ra�onn baic an achair agus a chabhra�onn liom mo thiomantas do mhuintir na h�ireann a chomhl�onadh mo phost mar Uachtar�n a �s�id chun l�mh a sh�neadh amach chuig daoine eile. T� s�il agam gur c�namh ar leith a bheidh ann naisc le daoine a chruth� agus a l�idri�, daoine a bh�onn ag sracadh leo go misni�il � l� go l� le deacrachta� an tsaoil, go h�irithe iad si�d a bhfuil m�chumas orthu, agus leis na pobail �ireannacha ar fud an domhain a bhfuil muintir na h�ireann an-bhu�och as a suim agus a gcabhair lean�nach. Is teaghlach iontach na h�ireann sinn ar fad le ch�ile. Beidh an sp�s f�or�il seo ina �it mar ar f�idir le daoine aonair agus le gr�pa� � ch�lra� cult�rtha agus traidisi�in �ags�la insint dom faoina mianta agus a mbriongl�id�, conas ar f�idir leis an bpost ina bhfuil s� de phribhl�id agam a bheith an ionada�ocht is fearr a dh�anamh ar son mhuintir na h�ireann agus ar na luachanna at� t�bhachtach d�ibh, conas ar f�idir le hoifig an Uachtar�in a bheith ina fh�rsa athmhuintearais san obair is m� at� romhainn mar phobal - s�och�in a chruth� ar oile�n na h�ireann. T� s�il agam go mbeidh an su�omh seo mar fhoinse eolais ar Oifig an Uachtar�in, ar a r�l agus ar sc�al an �itribh oifigi�il - �ras an Uachtar�in. Bain taitneamh as do chuairt. Christmas is a time set apart from all others, a time for family, friends, reunions, gifts and special greetings and so, to Ireland�s growing family at home and abroad, and to all her great friends throughout the world, I send the warmest of Christmas good wishes. In these days, our minds go back to the baby born in Bethlehem. He taught us that humankind would only flourish in love and he asked each of us to be bringers of love into the lives of those around us. Two thousand years on and we have seen, many times over, the awful price we pay for giving in to hatred or simply neglecting one another. Conflict, poverty and disease are ravaging millions of lives this very day. The Irish play a noble role in the international community�s response to that suffering. Ireland has a good story to tell of its own successful efforts to end generations of poverty and of conflict. The patient work of so many peacemakers throughout Ireland is bearing fruit at last. I hope that we will soon see the fresh start that the people of the north of Ireland have longed for and earned so painfully. The two jurisdictions which share this island have so much untapped potential just waiting to be revealed by peace and partnership. Let us hope that the waiting will soon be over. Among the gifts we can share with one another this Christmas is the gift of care on our roads. Our care costs us nothing. Our carelessness costs others everything, their lives, their health, their happiness. So I ask all of us, young and old, to take seriously our personal responsibility for road safety. Keep the crying out of Christmas. And to those who are feeling sad this Christmas time whether through loss, or illness, or absence, or worry, I pray you will find reason for joy and hope in the consolation and support offered by friends, family or community. To all the boys and girls who have worked hard at being good to impress Santa Claus I say well done and to all those who have worked hard to make our country strong and welcoming, prosperous and caring I say a heartfelt thank you. You keep the Christmas spirit going all year round and, in millions of acts of generosity, you let us see the power of love. Best wishes to one and all for a Happy Christmas, and a truly peaceful, fulfilling New Year. In case An post are late The President also sent all the Irish people a Christmas Card and a very nice card it is.